Go south from Coyhaique. After you pass Villa el Blanco, take a right to continue toward Cerro Castillo along the Carretera Austral. After a short while, you’ll enter Cerro Castillo National Park. Drive slowly; it’s common to see Huemules (South Andean Deer) along the side of the road. The route ascends until it reaches the Ibáñez park entrance (3,937 feet above sea level), which marks its highest altitude. After that, you’ll descend along the Diablo slope until you reach Villa Cerro Castillo, a good place to take a break, eat something, and appreciate the beauty of the massif that shares the town’s name. Continue south and prepare to begin your next adventure: driving on a gravel road. You’ll see Laguna Verde and, later, the Bosque Muerto (Dead Forest), caused by the 1991 eruption of the Hudson volcano. The road ascends to the Cofré park entrance and into the Murta Valley, where you’ll find the roads that lead to Puerto Murta and Sánchez. Keep right and 15 miles later, you’ll arrive at Puerto Tranquilo, which has beautiful views of Lake General Carrera, the second-largest lake in South America. Here, you’ll find various options for lodging, food, and excursions in town. Today, we invite you to explore Laguna San Rafael National Park, taking Route X-78 48 miles west from Puerto Tranquilo, where it begins to wind through the Exploradores Valley. The road is surrounded by forests, rivers, dozens of waterfalls, hanging glaciers, and snowy peaks. There is also the option––for more adventurous––of hiking on the Exploradores Glacier, which can be found on Mount San Valentín (12,828 feet above sea level), the highest peak in Patagonia. If you’re interested in completing this hike, you’ll need to hire a certified guide in Puerto Tranquilo. Another option is to set out in boat from Exploradores Bay, toward the marvelous Laguna San Rafael. This trip takes one full day, and you’ll also need to coordinate it in advance at Puerto Tranquilo. We suggest staying in Puerto Tranquilo for the night, as well. In the morning, before leaving Puerto Tranquilo, we suggest setting out to the Marble Chapels (“Capillas de Mármol”), which have been declared a Natural Sanctuary. You can leave from Puerto Tranquilo or from Bahía Mansa, 10 minutes south of Puerto Tranquilo. It’s also possible to kayak there with local guides. You can also travel south from Puerto Tranquilo to Puerto Sánchez, passing through Bahía Murta, where guides also offer excursions in boat to various marble formations on Lake General Carrera, which are lesser-known and further off the beaten path than the Marble Chapels. After your day exploring the area, drive north to Cerro Castillo, where you’ll find various options for lodging, food, and other tourist excursions. Set aside at least one full day to explore the various trails in Cerro Castillo National Park. For those who prefer shorter hikes, we recommend the Laguna Chiguay trail, which is accessible to all. For those who prefer longer hikes, there are guides who organize visits to Laguna Cerro Castillo for the day, a 9-mile hike that takes around 6 hours, round-trip. Before leaving Cerro Castillo, we suggest visiting the “Paredón de Las Manos,” or “Wall of Hands,” an 82-foot-tall rock wall south of Cerro Castillo where you can see 5,000-year-old cave paintings made by the Tehuelche people. Just 3.7 miles from the road that leads to the Paredón de Las Manos, you’ll also find the fork in the road that will take you to the beautiful Route X-723, which connects Cerro Castillo and Puerto Ibáñez. If you have time, we recommend driving along this 28-mile road, which offers glimpses of Lake Tamango and a beautiful view of the Cerro Castillo massif, as well as other lagoons and the Río Ibáñez falls. We highly recommend this detour, especially on clear days. Once you’ve reached Puerto Ibáñez, take the Carretera Austral again, via Route X-65, and drive toward Balmaceda, where you can set off for your next destination. Cerro Castillo National Park offers a spectacular 4-to-5–day trekking circuit, which is ideal for more seasoned hikers. Consider doing this hike before continuing south or spending a couple nights in Cerro Castillo to visit the Laguna Castillo with a local tour guide. You can also visit Laguna San Rafael with one of the boats that sets out from Puerto Chacabuco. Another option is to visit the Los Leones Valley sector, located south of Puerto Tranquilo, where you can organize hiking trips and horseback rides to the lagoon and glacier that share its name. You can add a few days to this itinerary if you’d like to visit Patagonia National Park, located 2 hours south of Puerto Tranquilo. From the Carretera Austral, you can also reach Balmaceda by taking Route X-697, which will bring you to the airport in just 7.5 miles. Keep in mind that this is a gravel road. 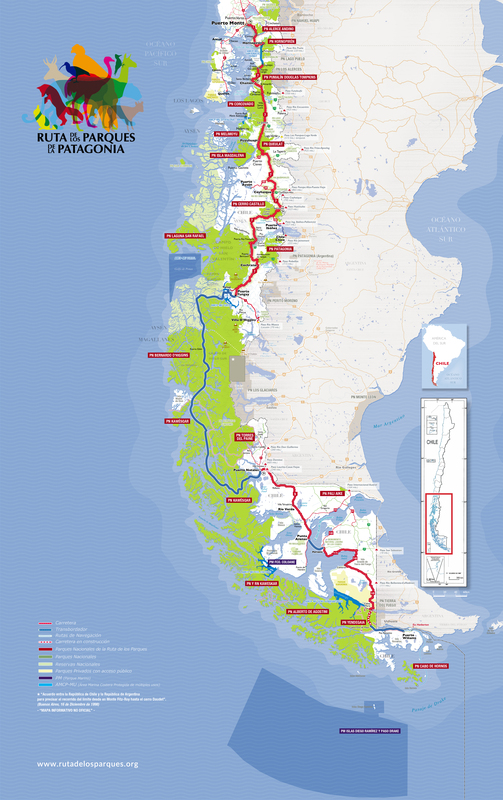 From Balmaceda, you can cross into Argentina via the Huemules Pass. Sky and LATAM Airlines offer daily flights to Balmaceda, located 34 miles southeast of Coyhaique. Cerro Castillo is located 40 miles south of the city of Coyhaique, along the Carretera Austral. From Coyhaique, continue south on the Carretera Austral for 139 miles. The road from Coyhaique to Cerro Castillo is paved the entire way. In fall and winter, keep an eye out for frost, which is common in the mornings. The road from Cerro Castillo south is gravel. Be sure to bring at least one spare tire. There are no gas stations in Cerro Castillo. There is a gas station in Puerto Tranquilo. At mile 47 (kilometer 75) along Route X-78 to Exploradores Bay, you need to cross a very narrow bridge, which does not allow for the passage of large vehicles such as motorhomes. If you’re driving a rental car and would like to cross into Argentina, don’t forget to ask for the required insurance and the border authorization to be included in your rental agreement. For more information about Huemules Pass, visit: http://www.pasosfronterizos.gov.cl/complejos-fronterizos/aysen/paso-huemules/. The magnificent Cerro Castillo peak lies 7,605 feet above Coyhaique and Río Ibáñez, and in the area surrounding it, you’ll find a trekking circuit that has been named one of the most beautiful in all Chile. The largest park in the Aysén region, with a captivating landscape of glaciers and snowdrifts that highlight the immensity of this wilderness.